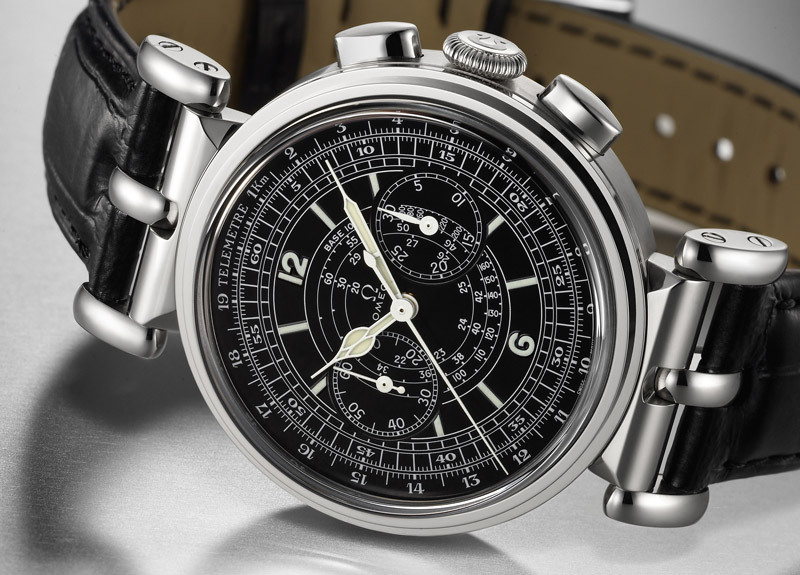 The “Milestone 1941” Collector’s Piece was the ninth release in OMEGA’s Museum Collection. This might be my very last blog for WatchPaper. Adam might ban me from the website after this. You see – I don’t wear “watches”, I wear timepieces. What’s the difference? When I think of a “watch”, I think of a $50 Timex that you bought at your local pharmacy. Or a TW Steel that a 17-year-old received as a graduation gift from his stepmom. No offense to WatchPaper- “watch” is the universally accepted term and I think it’s a great name for the site. But I wear timepieces, or ‘pieces for short. And we drop the apostrophe and just say, “piece”. A piece, to be precise, is a timekeeping device powered by a mechanical movement. It is not necessarily über expensive, but it is made by craftsmen and has some prestige and class. Let’s review some more vocabulary. A watch’s (pun intended) movement is its engine — it is the mechanical element that powers the watch and keeps time. Movements have cool names like Calibre This, Calibre That, or Calibre 123XYZ. I wrote a whole post on accuracy and on power reserve. Size refers to a watch’s diameter and is measured in millimeters. Classic size is 39-41mm while 42mm is quite standard today. Larger pieces like Panerai Luminor are 44mm and larger. Anything 44mm or larger is considered oversize. Height refers to the thickness of a case. 8mm-12mm is common with taller pieces being 15mm or so. I haven’t seen many pieces taller than 15mm. A crown is the doo-hickey that winds the movement and sets the time, date etc. The pushers are the cool stopwatch-looking things that activate other functions such as the chronograph. Lume refers to a watch’s luminosity. You may think that a glow-in-the-dark dial is a cheap, gimmicky thing, but strong lume is one way to tell a fake or a knock-off. You see, luminous material is very expensive and would not be used on a fake watch. I wrote a post on grail pieces. Lugs are the things that hold the strap in place and lug width is important as it determines the size of strap needed. I think 22mm is common lug width, with larger pieces such as Panerai having 24mm or more. A complication is any function performed by a watch in addition to displaying hours, minutes and seconds. A chronograph, for example, can time a racing lap or a steak on the BBQ. Of course, we could go on. I think the main thing is to be able to converse intelligently with a “watch” dealer….or at least sound superior when discussing with friends.